 Steel catch bar is compatible with semi-automated lift systems. 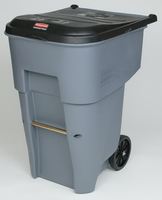  Meets ANSI Z245.60-1999 for Types B and G Rollout Carts.  Stable in high winds and on uneven surfaces.  Inset wheel position helps prevent damage to walls and doorways.  Molded-in foot tilter helps maneuver heavy loads.  One piece body construction provides superior strength and durability. 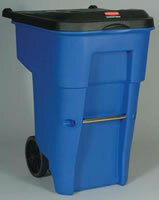 Trash Receptacles from your source for material handling equipment.